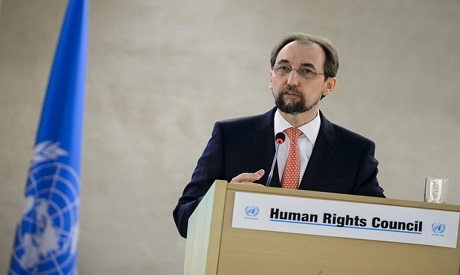 The United Nations Human Rights Council will hold a special session on Friday to discuss "the deteriorating human rights situation" in the Palestinian Territories, after Israeli occupation forces killed 61 Palestinians and injured hundreds on Monday. "The special session is being convened per an official request submitted this evening by Palestine and the United Arab Emirates," on behalf of the rights council's Arab Group and has so far received support from 26 states, a spokesman for the Geneva-based body said Tuesday. Friday's special session will begin at 0800 GMT Friday in Geneva to consider "the deteriorating human rights situation in the occupied Palestinian territory, including East Jerusalem," the spokesman said in a statement. The support of at least a third of the 47 members of the UN Rights Body -- 16 or more nations -- is required to call such a session. The UN Human Rights Council's announcement came as Israel faces mounting international pressure amid calls for an independent probe into the 60 Palestinian deaths. Protests and sporadic violence flared again on the Gaza border on Tuesday, though they were far fewer in number than the previous day, with two Palestinians killed by Israeli fire, Gaza's health ministry said. The killings overshadowed the opening of the new US embassy in Jerusalem, relocated from Tel Aviv in fulfilment of a campaign promise by US President Donald Trump, whose daughter Ivanka attended the inaugural ceremony. The UN Security Council in New York held an emergency meeting Tuesday on the violence in Gaza, with Kuwait preparing a draft resolution to protect Palestinian civilians and the United States defending ally Israel's use of "restraint".